Rev John E. O'Hallaran S.S.J. Reverend John E. O’Hallaran, 80, of Long Branch passed away Sept. 2nd. He was born in Jersey City to the late John and Harriet (nee: Fitzgerald) O’Hallaran. Father John was a 1956 graduate of Red Bank Catholic H.S. and started in evangelical ministry as a teenager where he lived and was raised in Asbury Park, NJ. In 1961 he entered the Brotherhood of the St. Joseph Society of the Sacred Heart. 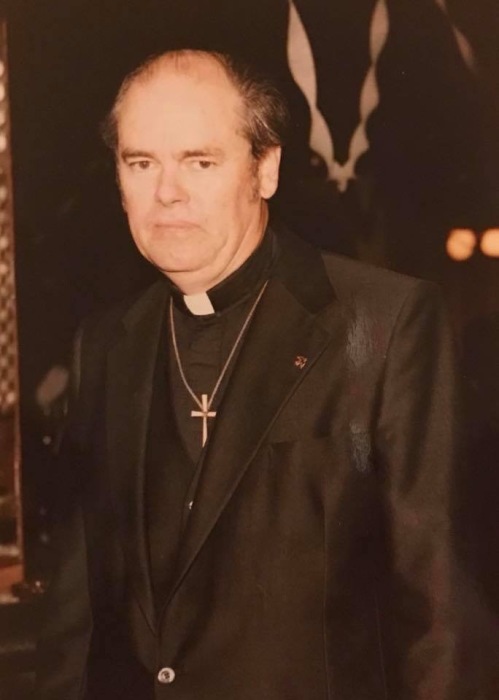 In May of 1985, he entered the priesthood in the St. Joseph Society. He served as the Pastor of multiple parishes in Louisiana, Texas and Mississippi. Father retired in 2016 and lived in St. Joseph’s Manor in Maryland before returning home to N.J. in 2018. He is predeceased by his embraced extended family members, Mildred and Jose Rodriguez. He is survived by many cousins, and members of his embraced extended family: Dominga, Evelyn-Sophia, Iris, Maribel, and Edwin Rodriquez. A life celebration will be held Friday, Sept. 7, 2018 from 9:00 – 10:00 am at the John E. Day Funeral Home. 85 Riverside Ave. Red Bank, NJ with a Mass of Christian Burial at 10:30 am at St. James R.C. Ch. Broad St. Red Bank, NJ. Interment will follow at St. Joseph’s Cemetery, Clayton, DE.